Beach entry pools are all the rage, and when one examines the pros and cons, it’s easy to see why. A beach entry pool, also called a zero entry pool, is a pool with a gradual tapered downward slope into the pool instead of the traditional steps or ladder. Who wants a beach entry pool? People with mobility issues love them because the treacherous steps down into the water are no longer an issue. People with children, people who like the control of enjoying the exact depth of water they’re in, and virtually anyone who loves the ease a beach entry pool offers. Because of the beach entry, people often opt to continue with the beach look by including water features, rock formations, tropical-looking plant material, and even sand to complete the theme. Lounging blissfully in a few inches of warm water, it’s hard to believe that you aren’t actually on the beach. And, make no mistake--the water will be warm since shallower water heats faster. That by itself will be a huge selling point for some folks. 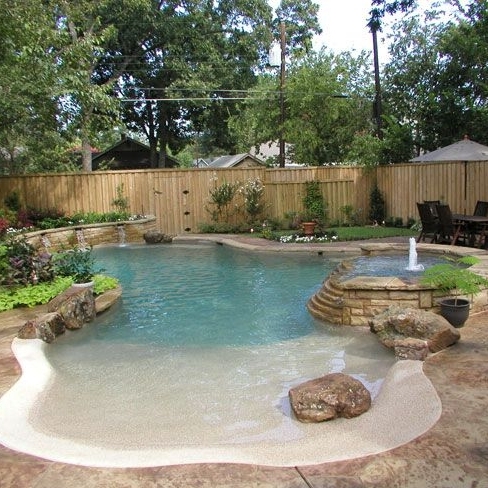 One of the essential features of a beach entry pool is enough space has to be available to build it. While some people want to renovate their old pool into a beach entry pool, a beach entry pool will require more space than a traditionally shaped pool, so the additionally needed space is a consideration. If you have a pet, you’re going to have a tough time keeping them out of the water unless there is a separately fenced area for them to play. If the dogs have free access to the pool, it’s going to require more cleaning. In some areas, people report wildlife visits to the pool. Cost is also a factor. A beach entry pool is a high-end renovation project, so it’s going to cost more than a traditional pool, particularly if the homeowner opts for the more elaborate beach setting. There is no end to the options, such as water spouts, a tanning edge or jacuzzi, a swim-up bar, fountains, and lighting. Once the homeowner begins to create the pool masterpiece of their dreams, it’s understandable that they want everything to be just right. When they get time off, there’s not much reason to hit Cancun or Cabo when you can have a staycation that doesn’t include fears of jellyfish or drug cartel kidnappings. A beach entry pool isn’t for everyone. It is a higher-end project, and if the backyard is small or inaccessible to excavation equipment, it could create problems. But still, it’s easy to see why a beach entry pool has become a hot trend we expect to continue for the foreseeable future. Because who wants a beach entry pool? Everyone!